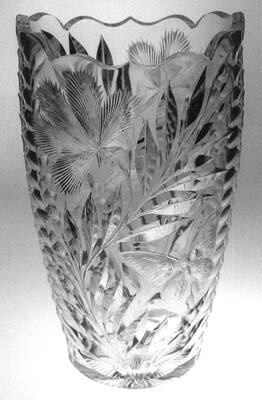 Hawkes introduced its version of stone-wheel engraving in 1903 and called the glassware “gravic.” The engraved flowers usually have miter-cut leaves and stems (Sinclaire and Spillman 1997, p. 69). 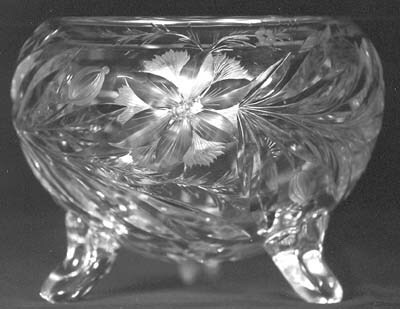 Three of the many Hawkes Gravic patterns were patented: Gravic Carnation, Gravic Floral, and “Gravic Tiger Lily.” Some gravic pieces are signed with “Gravic Glass” acid-etched above the trademark’s familiar trefoil; one also finds “Gravic Glass Pat’d” in this position, but rarely. The company also signed some gravic pieces with the regular Hawkes trademark. 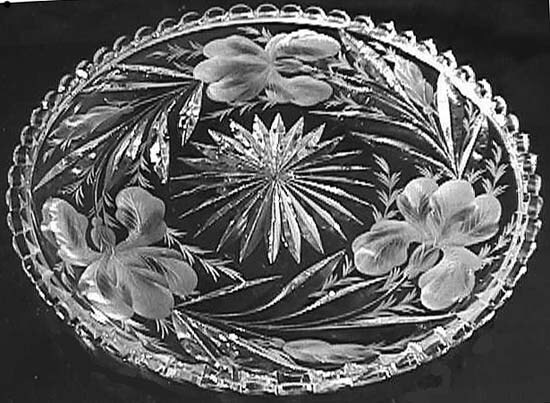 Early Hawkes gravic glass can be quite elaborately cut and engraved as shown by this fern dish. Later, gravic designs were considerably simplified. A non-patented pattern, Satin Iris, was produced over many years. Although catalogued separately from the Gravic Iris pattern, the two patterns appear to be identical. 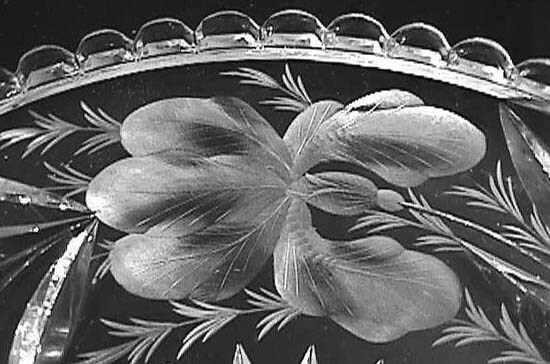 Tray cut and engraved in the Gravic (Satin) Iris pattern by T. G. Hawkes & Company. Signed with the “Gravic Glass” trademark. L = 11.25″ (28.6 cm), wt = 4.5 lb (2.0 kg). Sold for $749 at an eBay auction in 2003 (Images: Internet). The Pairpoint Corporation’s Dianthus pattern is one of this company’s many stone-wheel engraved patterns that incorporate flowers and butterflies. Deeply engraved flowers, such as in the example below, are of particular interest. The stems and leaves are miter cut. Most of the company’s engraved patterns are shallower than this example.